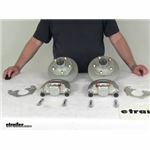 Trailer disc brake kit includes 2 assemblies with Dacromet-plated rotors, hub spacers, calipers and mounting brackets. Assemblies fit 2,000-lb axles with 10" to 13" wheels. The 8" rotors feature a 5 on 4-1/2 bolt pattern. 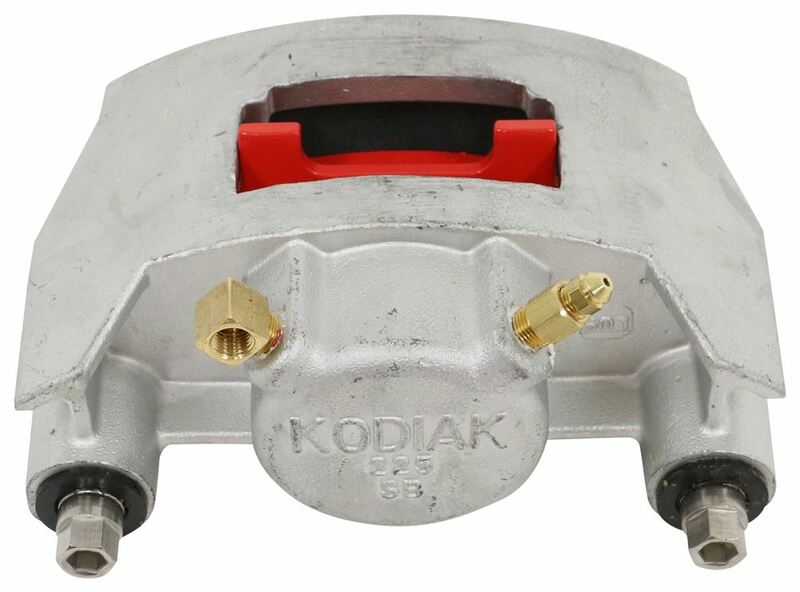 Lowest Prices for the best trailer brakes from Kodiak. 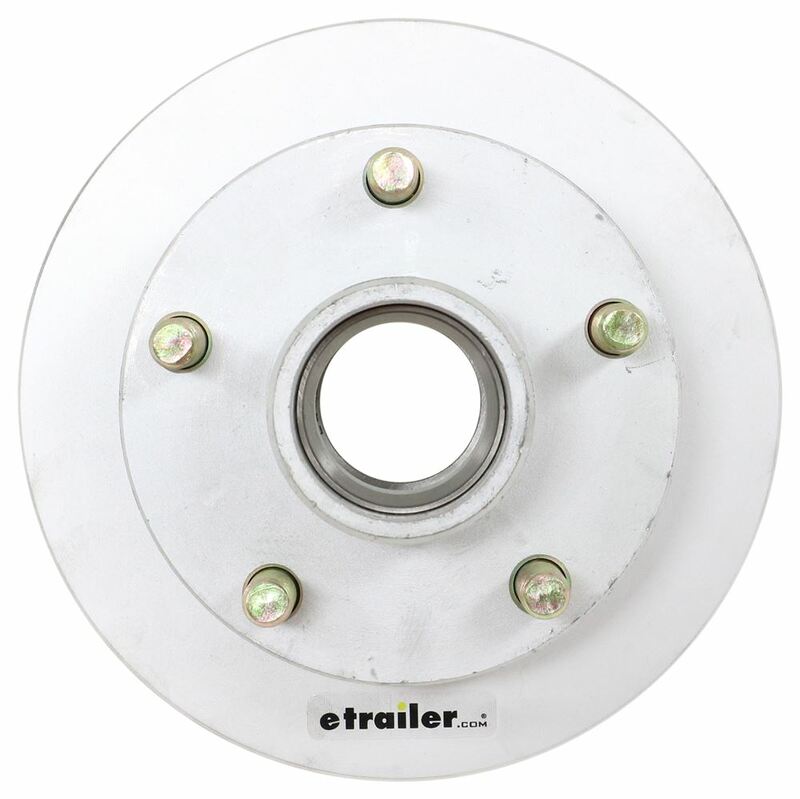 Kodiak Disc Brake Kit - 8" Rotor/Hub - 5 on 4-1/2 - Dacromet - 2,000 lbs part number K2HR2D can be ordered online at etrailer.com or call 800-298-8924 for expert service. 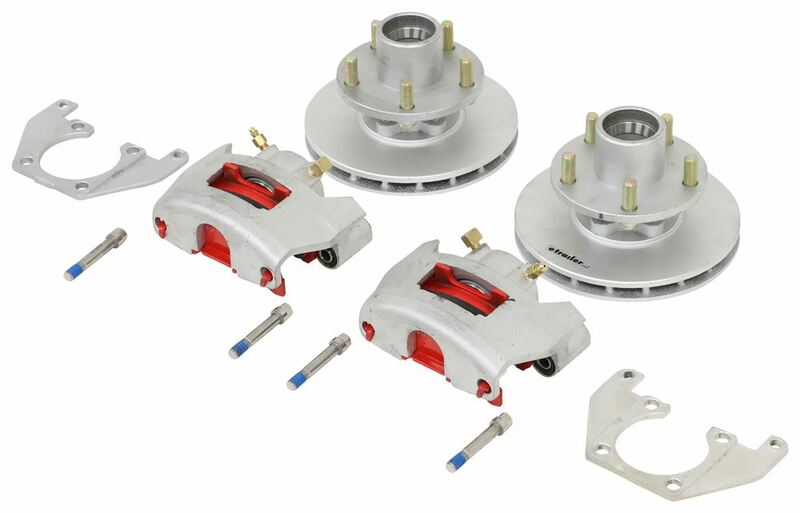 Trailer disc brake kit includes 2 assemblies with Dacromet-plated rotors, hub spacers, calipers and mounting brackets. Assemblies fit 2,000-lb axles with 10" to 13" wheels. 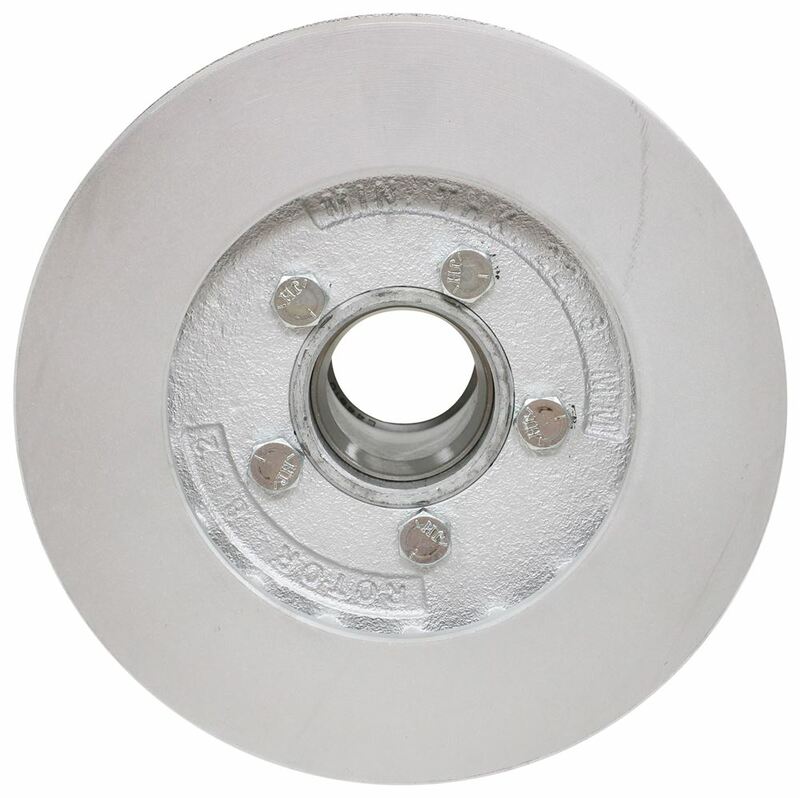 The 8" rotors feature a 5 on 4-1/2 bolt pattern. 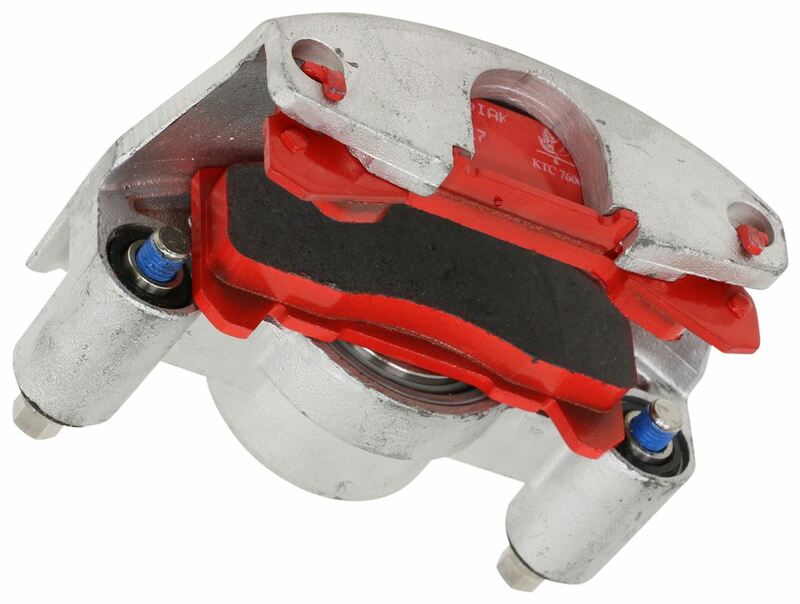 Wheel size: 10" to 13"
Disc brake calipers have only one moving part, rather than the many found in drum brakes. This means that there are fewer parts to maintain, fewer parts to get damaged and fewer parts that will require repair or replacement, thus reducing maintenance costs. 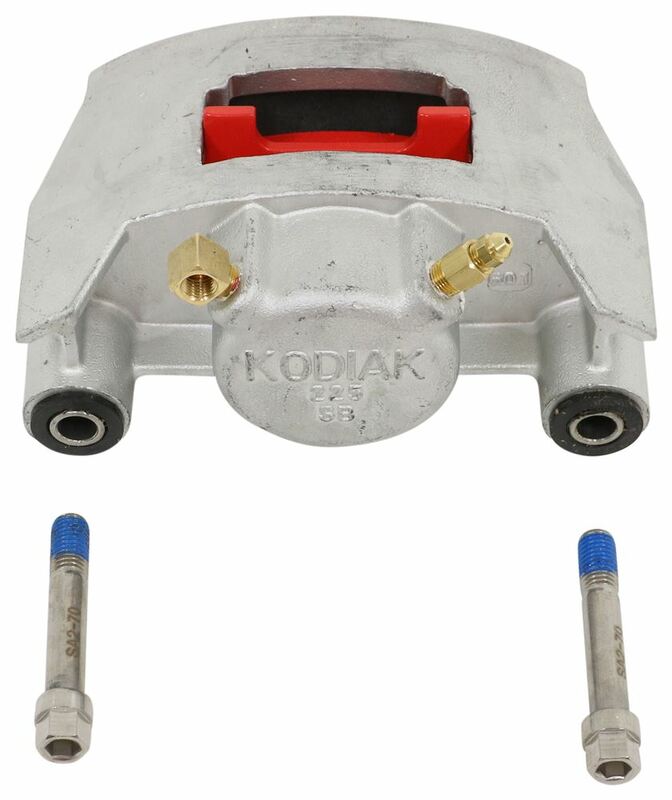 Kodiak's slip-on, cast iron rotors work in conjunction with the included hub spacers to easily convert your idler axle to a disc brake axle. The hub spacers are designed to replace your standard idler hubs, and they come furnished with races and wheel bolts (bearings and seals are sold separately). Once the spacers are in place, the rotors can be slipped on. 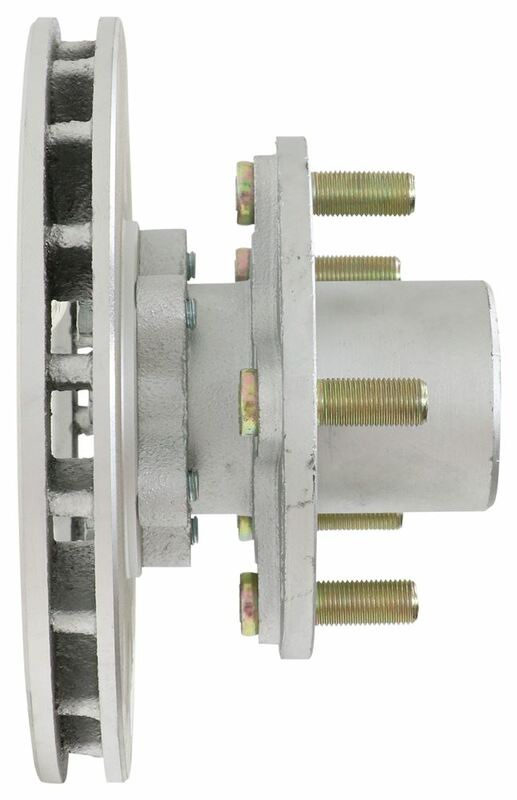 With a separate rotor and hub, you can easily repair or replace just one element of your brake system without having to junk the whole thing. 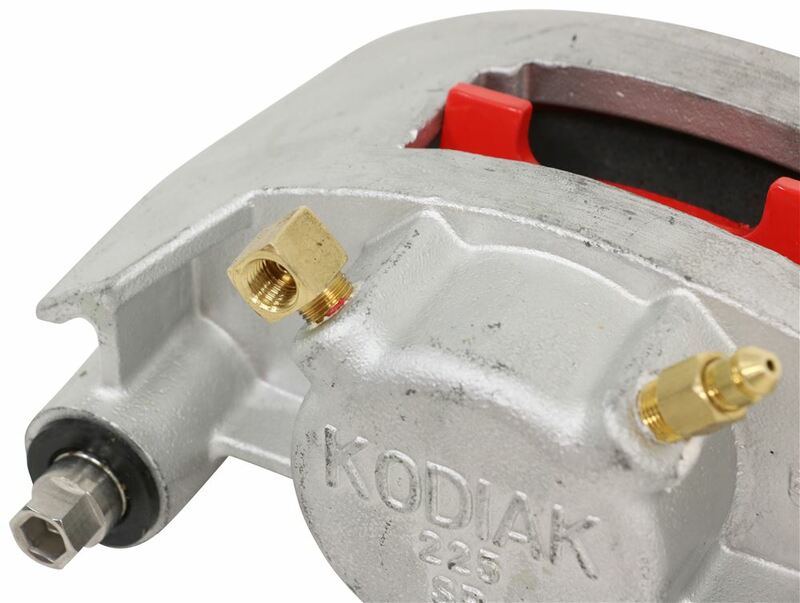 Kodiak calipers are constructed of cast iron to prevent flexing. Less flex means more braking torque, resulting in smooth, even braking every time. The corrosion-resistant stainless steel piston is 30 percent larger than standard pistons, ensuring shorter stopping distance and increased torque. In addition, the unique low-drag design of Kodiak's calipers allows the piston to retract farther than in most standard models, giving you a cooler-running brake. Designed for axles with 4-bolt brake flange configurations, the included mounting brackets are made of heavy-duty ductile iron that is embossed to provide additional threading for guide bolts. 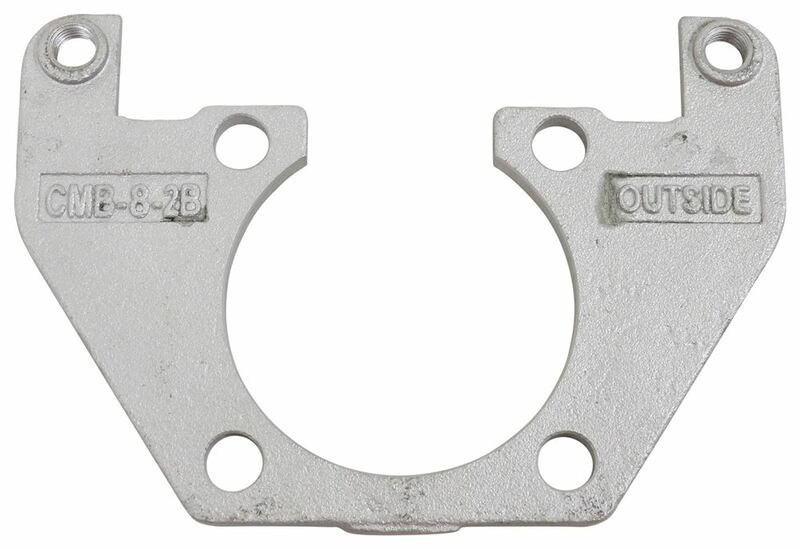 The added thread strength ensures a tighter, more secure connection between the caliper and bracket. Another unique feature of Kodiak's brackets is the side-support angle, which guarantees that the load is carried by the bracket, rather than the bolts. 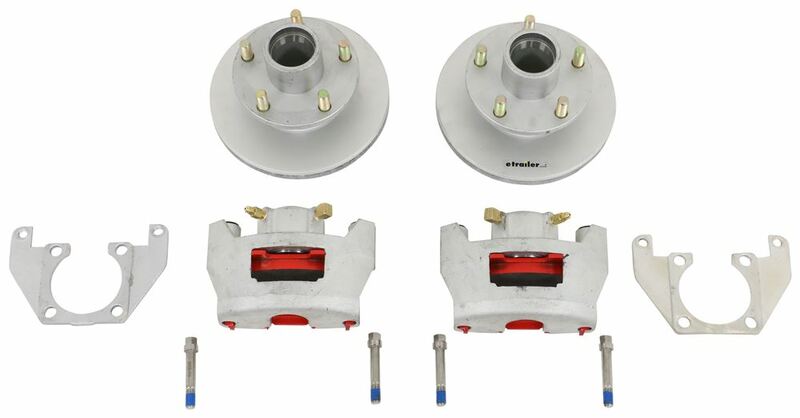 Trailer disc brake kit includes 2 corrosion-resistant, Dacromet-plated hub-and-rotor assemblies, as well as stainless steel calipers and dacromet mounting brackets. Assemblies fit 13" and larger wheels and axles with 4-bolt flanges. Speaker 1: Today we're gonna take a look at the Kodiak Dacromet Disc Brake Kit with the 8" hub and rotor, five and 4-1/2" full pattern for 2,000 pound axles. Now this brake assembly makes it very easily to upgrade from drum brakes to disc brakes for better performance. This brakes will deliver better performance than drum brakes cause you get more consistent stopping, even at highway speeds. And dramatically shorter stopping distances. Also, the maintenance costs are lower than for drum brakes cause you have few moving parts to maintain, repair and replace.Now this kit will include two full brake assemblies. It includes two dacromet plated cast iron rotors. The two dacromet plated cast iron hub spacers that are already installed. Two of the dacromet plated cast iron calibers with the four stainless steel caliber mounting bolts and then inaudible 00:00:47 two dacromet plated ductile iron caliber mounting brackets. Now the dacromet plating provides superior corrosion resistance for fresh water or salt water use. Right here they have a slip on cast iron over the hub rotor that'll mount, two a these included, spacers.The hub spacers will replace your standard ivor hubs. Now this does use industry standard bearings and seals that we do sell separate on our website. Now the bearing races will already be pre-installed into the hub. 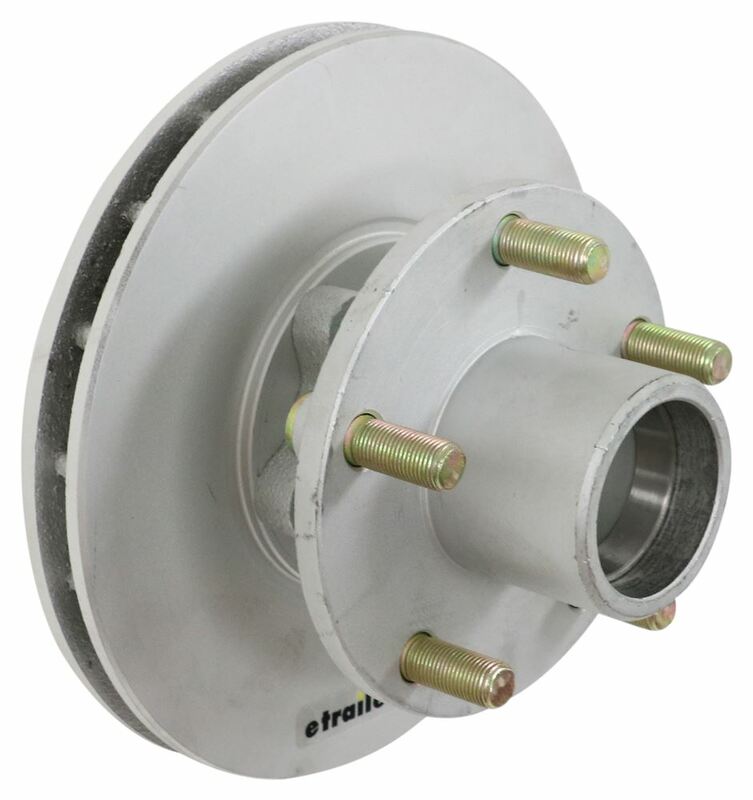 The rotors, you can see are vented to prevent heat related damage by dissipating the heat. And the calibers they are a cast iron caliber. They're self adjusting for smooth equal braking. The cast iron construction does not flex like aluminum. It is a low drag design so it retracts the piston further than other calibers for a cooler running brake.And I just wanna show you . Let me take the aluminum pads out here. Here is the stainless steel piston in here. It's 2-1/4" in diameter. It's about 30% larger than other brands, sort of give you more braking torque than the competition and they do come with the high performance ceramic brake pads. 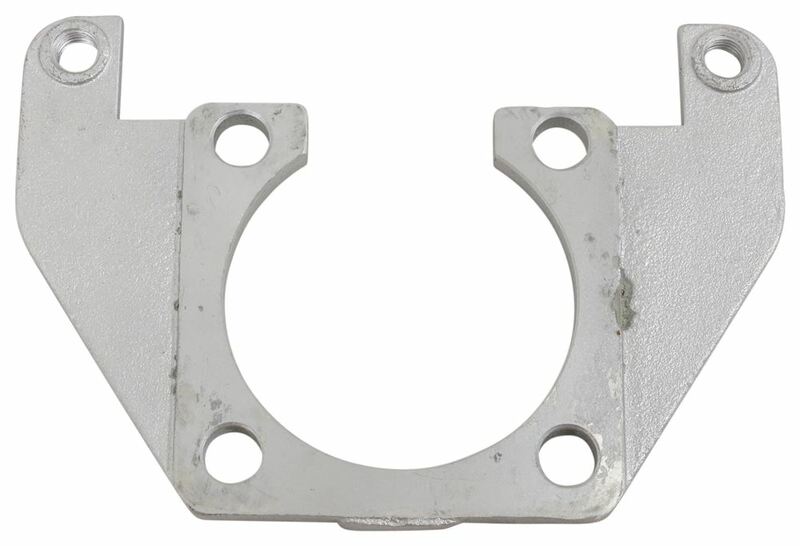 Now the ductile iron mounting brackets, they do provide strength and durability. They give you side support angle design that'll ensure that the load that the load is placed on the bracket, not just the bolts. Does have extra embossing for additional thread contact to ensure nice tight secure mounting for the caliber guide bolts. And you can see it is a design is for a four bolt brake flange mounting configuration.Now hydraulic brake actuator and brake lines are required for these brakes to be activated. We do sell those separately on our website. You do wanna make sure that the brake actuator and the lines that you get will have to have at least a 1500 psi rating. These parts are made in the U.S.A. Again, it's designed to fit 2,000 pound axles. The wheel size it'll fit on these is anywhere from 10" to 13" diameter. The bolt pattern is a five around 4-1/2" bolt pattern. The rotor diameter edge to edge is 8" and the wheel stud diameter is a 1/2". But that should do it for the review on the Kodiak Dacromet Disc Brake Kit with the 8" hub and rotor, five, one 4-1/2" bolt pattern for 2,000 pound axles. On the Kodiak disc brake kit for 2,000 pound axles # K2HR2D it measures 3.45 inches from the hub face to the brake mounting flange. Compare that to the hubs you have now to determine if the disc brakes will make the wheels further from the trailer. I have included a picture as well showing some other dimensions. What is the diameter of the spindle where the inner bearing rides? If it is also 1 inch we have the Kodiak disc brake kit part # K2HR2D that will fit the spindle. Otherwise if you have a different dimension there we wouldn't have a fit. Mounting the calipers of the Kodiak brake kit part # K2HR2D in the 12:00 position will still work. Since the bleeders would still be on top of the setup the air will still bleed out of them. Basically the calipers can install in nearly all positions but in the standard positions bleeding is a bit easier since air wants to float up. All of our trailer wheels have a zero offset which means that the mounting flange for the wheel is centered in the wheel. This means that the wheel would stick out about half the width of the wheel/tire past the hub/drums of the trailer. If instead you were asking about the wheel location relative to going from drum to disc brakes like with the kit # K2HR2D the wheel would end up in the same location. 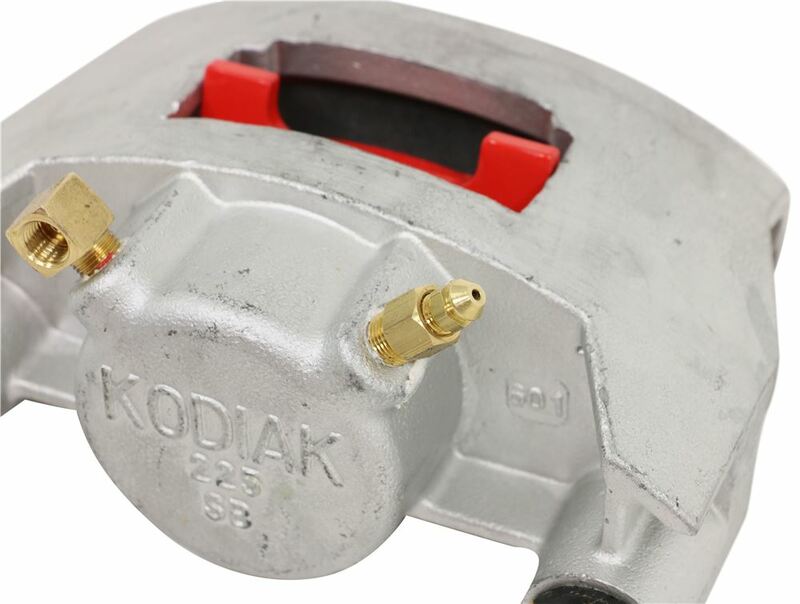 If you install the Kodiak Disc Brake Kit # K2HR2D with the included bolt on mounting flange you would not have to worry about the piston not fitting with the bracket. I attached a picture that shows the backside of the caliper and you can see that the piston does not stick out past the bracket mounting surface.